Starting today, you can upgrade your account to a Premium account. It does not give you any extra features, but it helps us improve Photopea for you. After logging into Photopea, you can open open the Account window with details about your account. 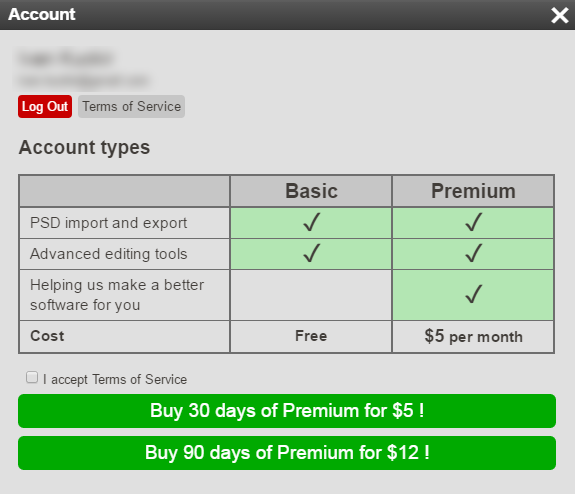 There is an option to upgrade to Premium for 5 USD per month. After upgrading to Premium, your Account button becomes green and you can start being proud of yourself. You just helped Photopea get financing for the future development. Upgrading to Premium is completely voluntary. It is up to you, when and how often you upgrade. In the future, you may get access to beta features or extra themes, but right now, there is absolutely no difference.